Posted from Portland, Oregon, United States. 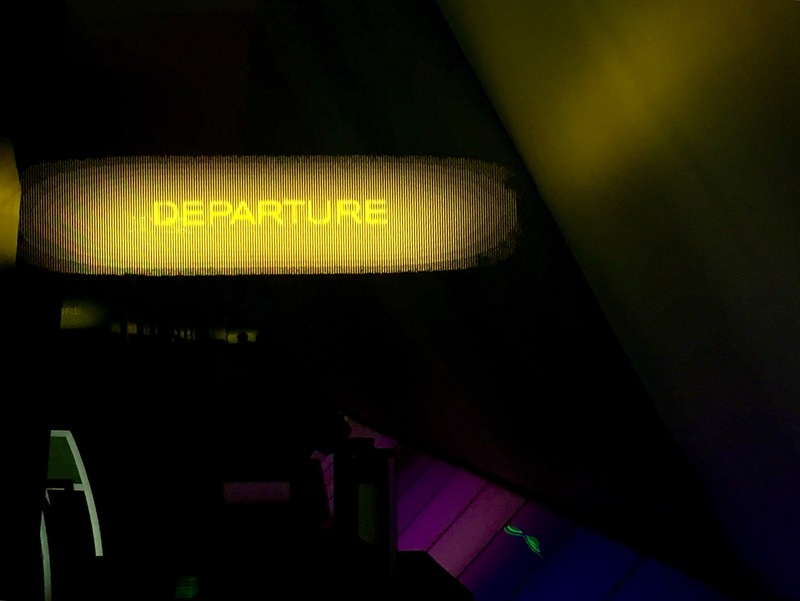 I certainly felt underdressed as we entered Departure on the 15th floor at the edge of old town Portland wearing jeans and a sweatshirt. 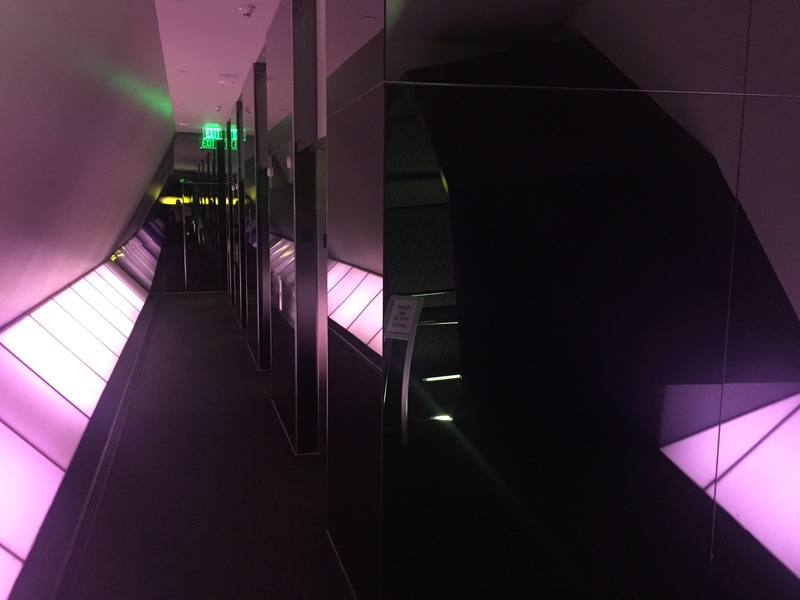 Once clearing the elevator you’re greeted with a glowing mirrored lobby worthy of Space Mountain leading into a Liebeskind-inspired lounge. 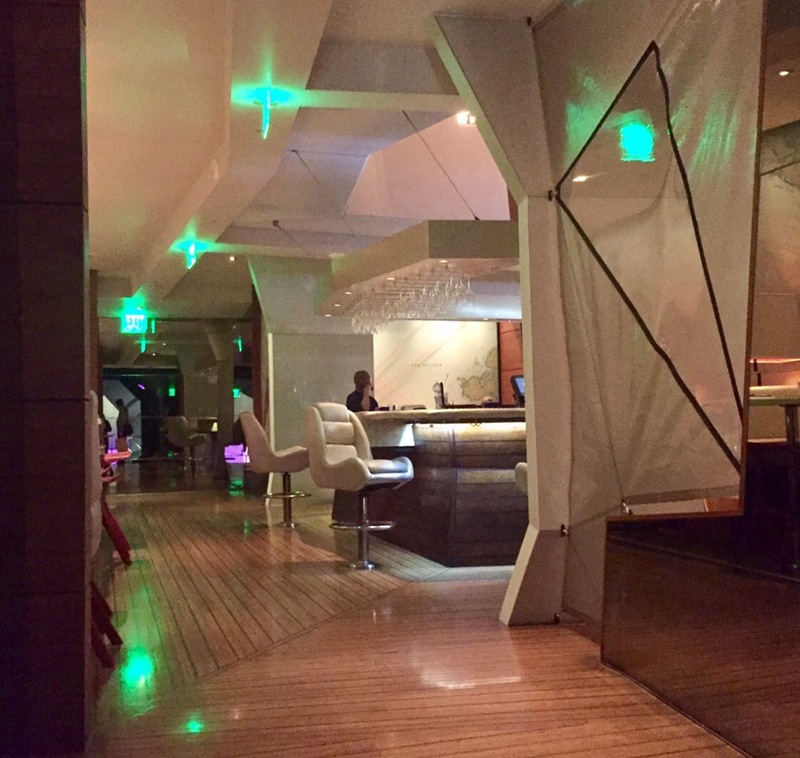 Wrapping around a central bar, you have fantastic views out over Portland and the river, but the elevation doesn’t justify the crazy high drink prices – $21 for Oban 14 as an example and $100 for the famous Yamazaki 18. The food is a different story where they’re clearly taking dietary restrictions seriously. This is the first time I’ve seen a place with a “nightshade-safe” menu, and they asked about a dozen times if my wife was OK with certain dishes, almost freaking out when she selected a dish that they hadn’t cleared. After the reassurances that she wouldn’t go into anaphylactic shock, we ordered some drinks and dove into the tapas-like Asian fusion menu. 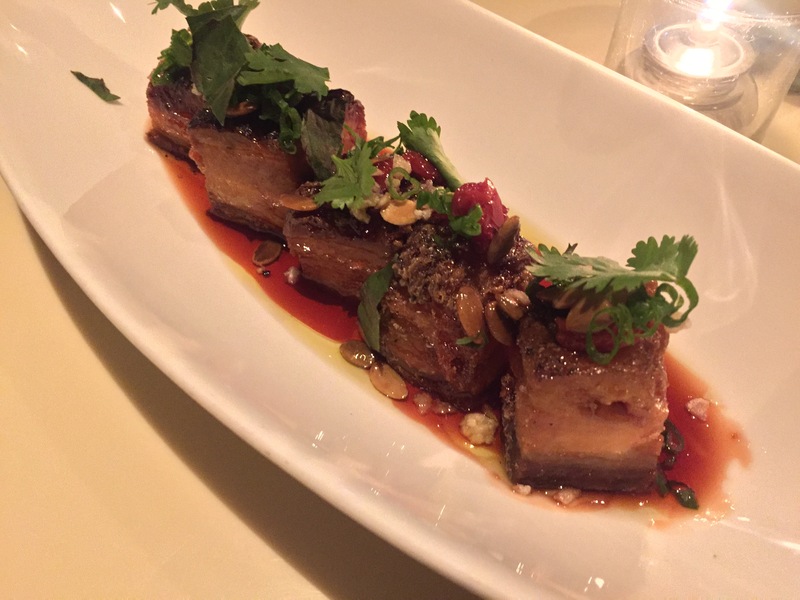 The first plate to come out was crispy pork belly with a sweet and tangy chili sauce made from rice vinegar and honey. Topped with pumpkin seeds and cilantro, we’re in for a real treat if this is representative of the menu. 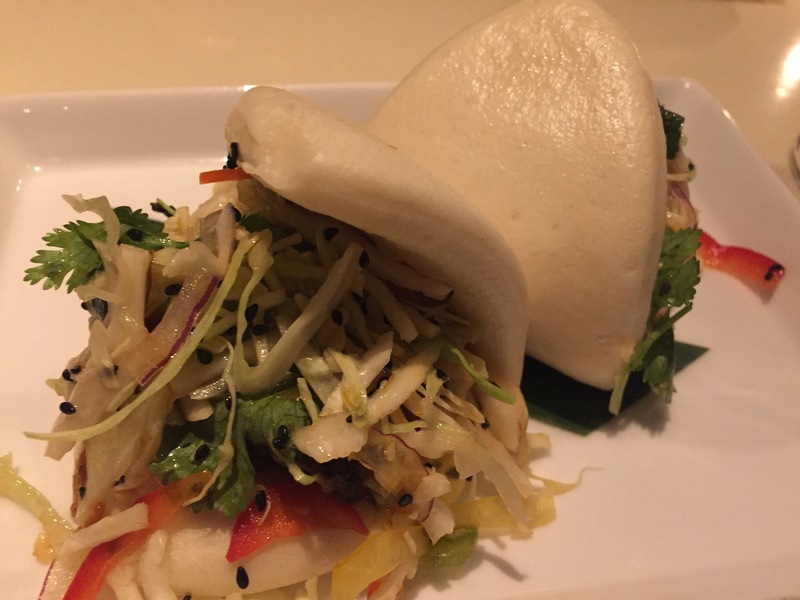 BBQ short rib buns have a luscious and tender shredded pork with a hoisin sweet sauce topped with a spicy buttery Mexican coleslaw that perfectly complements the fatty pork. Next up a smoked salmon roll served with real wasabi. 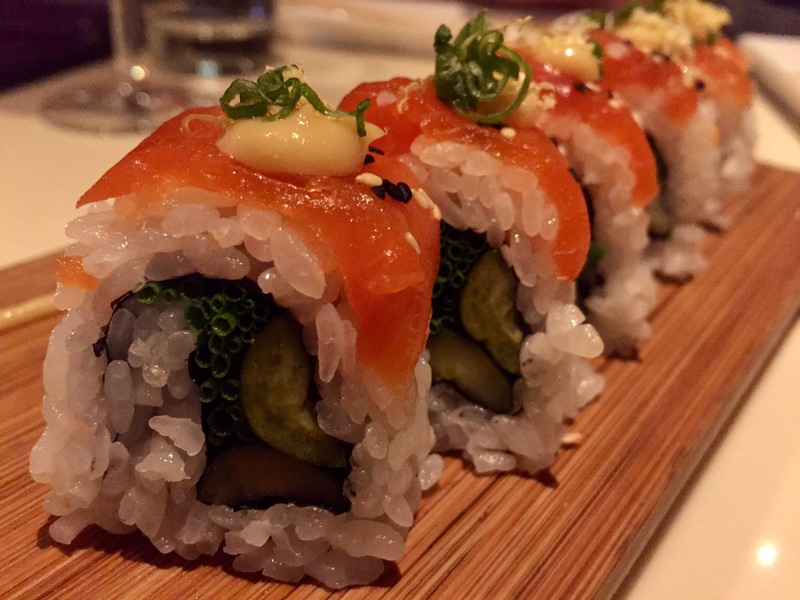 Crispy cucumber chives and salmon is tipped with a spicy smokey mayo that sears the tip of your tongue pleasantly. I’m not usually a fan of seafood, but I would certainly order this again. 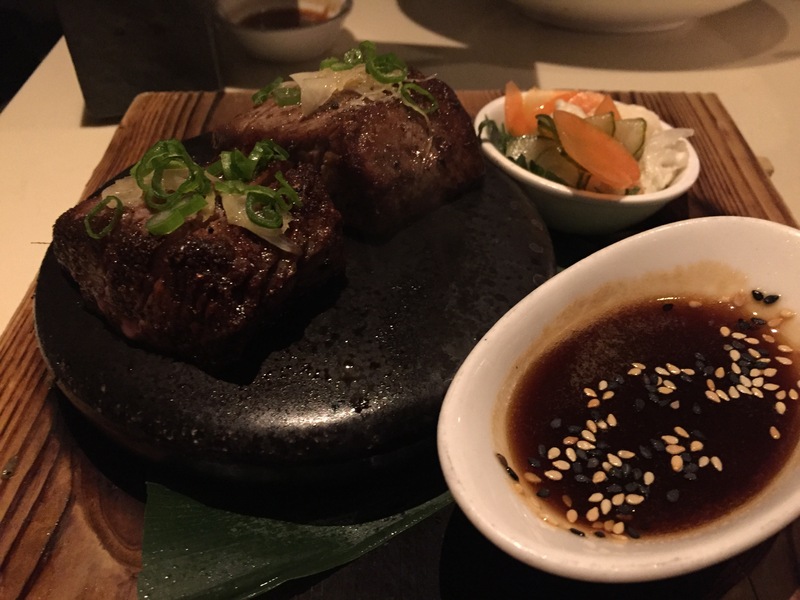 Izakaya steak – 4.5 ounces of Wagu beef on a hot stone served with some sweet pickled vegetables. Dip the beef multiple times in the ginger-sesame-soy sauce and return it to the stone to keep it from overcooking and to build up an amazing caramelized and savory sear. DO NOT let this beautiful tender beef over cook. It is already perfectly done when brought to the table. 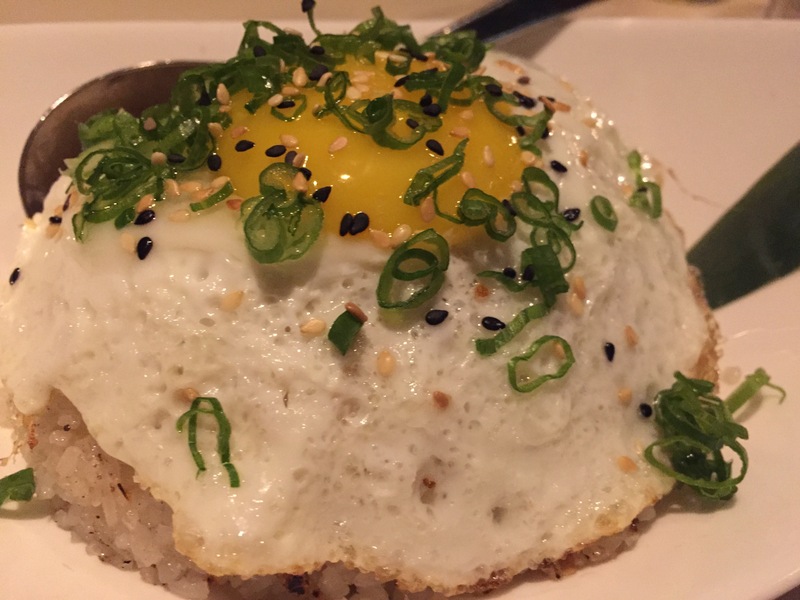 Then too fill us up, garlic fried rice with an egg on top. 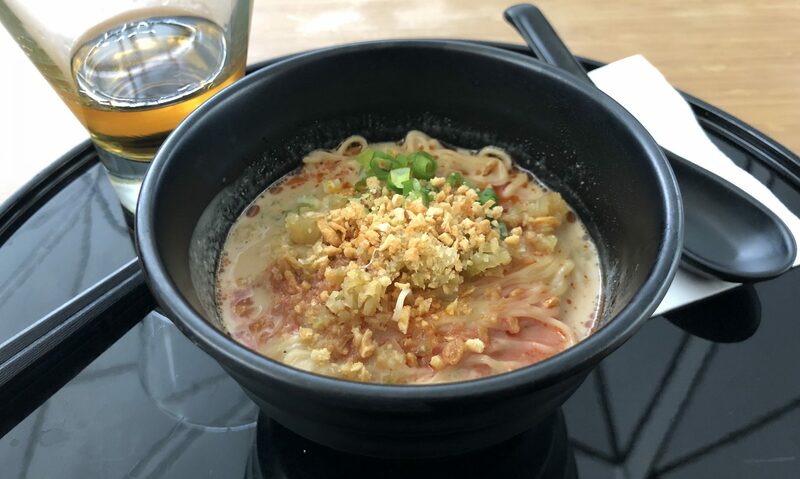 Delicious, but no crunchy bits and I would have doubled the garlic. Overall very delicious and glad we came, even given the flaws. It’s worth the views, but perhaps not the price. Next PostNext Do do that Voodoo that you do.